OP3224. AIDA, Live Performance, 26 Dec., 1970, w.Cleva Cond. 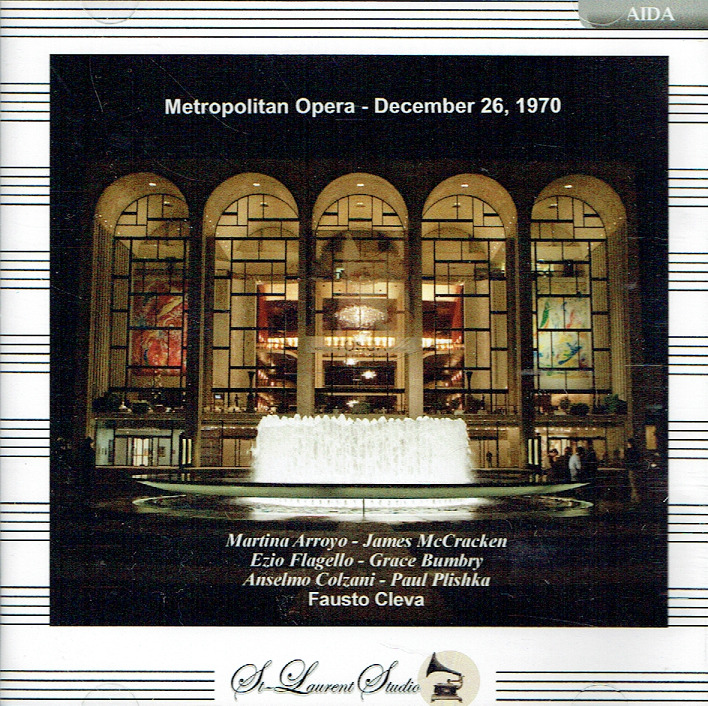 Met Opera Ensemble; Martina Arroyo, James McCracken, Grace Bumbry, Anselmo Colzani, Ezio Flagello, Paul Plishka, etc. [An exceptional and little-known latter-day broadcast from the Met featuring the glorious Arroyo, plus McCracken and Colzani in two of their signature roles] (Canada) 2-St Laurent Studio stereo YSL T-515. Transfers by Yves St Laurent. "Born in Harlem, the daughter of a Puerto Rican father and an African-American mother, Ms. Arroyo made her debut in 1961 in a small role, the Celestial Voice in DON CARLO. During the 1961-62 season, she proved a trouper at the company by singing various supporting roles in Wagner's RING cycle, including the Third Norn, Woglinde the Rhinemaiden and Ortlinde the Valkyrie. After a three-year absence, her Met breakthrough came in February 1965, when she sang her first Aida. That October in DON CARLO she stepped way up from the Celestial Voice to Elizabeth of Valois. In all, she would sing some 200 performances at the Met. Today, Ms. Arroyo still contributes to opera by running the Martina Arroyo Foundation, which presents young singers in thoroughly prepared and staged productions of central repertory works. She remains an inspiring role model to emerging artists." "In March 1958, Arroyo, along with Grace Bumbry, was among the winners of the Metropolitan Opera Auditions of the Air. Met general manager Rudolf Bing took a continuing interest in her, and her Met debut came the following year, as the Celestial Voice in DON CARLO. As a young lirico-spinto, she performed small parts for three seasons; during this period, she also sang Aida under Herbert von Karajan in Vienna and Karl Bohm in Berlin. Her ambitions grew, and eventually she left the Met for a time and made Europe the center of her career, with considerable success. On 6 February, 1965, she made what came to be called her 'second' Met debut, filling in for an ailing Birgit Nilsson in AIDA. That evening's audience experienced a great sense of discovery, and Martina went on to become a favorite in the Italian repertory. Arroyo was a fixture on Met opening nights: starring in ERNANI in 1970-71, DON CARLO in 1971-72 and IL TROVATORE in 1973-74. She had her greatest success with AIDA, Leonora in both TROVATORE and LA FORZA DEL DESTINO and Elena in I VESPRI SICILIANI She had her greatest success with AIDA, Leonora in both TROVATORE and LA FORZA DEL DESTINO and Elena in I VESPRI SICILIANI - all of which took advantage of the soaring, plaintive quality in her voice. Her rendition of FORZA's 'Madre, pietosa Vergine' achieved a forlorn quality few other singers ever matched. There was a sheen, a gleam to her sound that made many sopranos in the same repertoire sound ordinary and uninvolved by comparison, and when she finished off a line, it seemed to linger in the air for seconds afterward. During the 1970s, when television variety and talk shows were still welcoming classical musicians, Martina was a popular guest on THE TONIGHT SHOW, where she showed America that she was a hilarious raconteuse. She further punctured the cliché of the stuffy diva when she appeared as a guest on the ABC sitcom THE ODD COUPLE. On a 1970 Met intermission feature, she had her colleagues Joan Sutherland and Marilyn Horne doubled over with her hilarious responses to every topic of conversation. Later, she embarked on a teaching career at Indiana University. Frustrated by the school's lack of emphasis on total role preparation, she made that goal the cornerstone of the Martina Arroyo Foundation, which gives detailed, intensive instruction to talented young singers who desperately need it. I don't think that Martina's good humor is a mask for anything; I think its source is a happy and rewarding lifeï¿½.It was Mrs. Arroyo [Martina's mother] who, back on 111th Street, used to take over for the apartment building's boozy superintendent and wash the floors. 'She put Clorox on everything', Martina recalled. 'It's amazing I'm not white'. Most of all, what I admire about Martina is her large-spiritedness. There's no meanness or pettiness about her. She has created a life that is only to be admired. It's a pleasure to sit at her dinner table. It's a pleasure just thinking about her. All her life, she has answered in the affirmative, and the rest of us are better off because of it. Martina Arroyo has reached her status as one of the leaders of New York's arts world in the best of all possible ways - by seeking out the best in herself, and in others, at all times. "One of the most enduring and memorable discoveries of my early opera-going years was this outstanding soprano, Martina Arroyo. Having heard her in recital, in concert and at the 'old' and the 'new' Met, in a great variety of repertoire, I can attest to her magnificence in any material she chose to sing, and that if it hadn't been for the Met's and Leontyne Price's iron grip on Aida, Arroyo would have reigned universally supreme in this role. Price's shimmering top, especially early in her career, was indeed unforgettable, but Arroyo had that as well, combined with a beautifully aligned voice and a true Verdi line. Whether it was in Verdi, Puccini, von Weber or Barber, she truly had the voice and style for it all! Her 'Domine Deus' & 'Agnus Dei' from Poulenc's GLORIA [above] display her luscious voice to perfection! Utterly ravishing!" "Mr. McCracken was present for some historic moments in this first Met career. He sang in the debut performances of Marian Anderson, Maria Callas and Renata Tebaldi. But he found it understandably frustrating. On the night of Miss Tebaldi's debut in OTELLO, for instance, he did not even get the grateful secondary tenor part of Cassio; he sang the tiny role of Roderigo. It is not quite the case that Mr. McCracken went unnoticed at the Met in those years; on one occasion in 1954, a Times critic devoted an entire paragraph to praising him in the brief part of the Messenger in AIDA, certainly a rare accolade. But the management did not notice, and so Mr. McCracken took himself to Europe. He built up valuable experience singing big roles repeatedly in Bonn, then in Zürich, gradually coming to the attention of the larger European houses. Once he had become a leading Otello abroad, the Met could hardly afford to hold his hasty departure against him; he returned in 1963 as a star, with a new production and a whole list of other choice roles. He specialized in the biggest Italian parts. The high point of Mr. McCracken's Met activity came in the early 1970's, when he starred in new productions in five consecutive seasons at the house: OTELLO, CARMEN, AIDA, LE PROPHETE and TANNHAUSER - his first Wagnerian part, which he accepted after declining many earlier offers to sing Wagner. But when OTELLO was televised twice without him, and a telecast of TANNHAUSER that the tenor felt he had been promised was dropped in 1978, the tenor abruptly severed his relations with the house. The house had to do without him in some of the hardest-to-cast roles in the repertory for six seasons while the tenor sang elsewhere, but the promise of a 'Live From the Met' slot at last moved him to let bygones be bygones. The telecast took place on the occasion of Leontyne Price's farewell to opera in AIDA, with Mr. McCracken singing Radames." "In 1958 Grace Bumbry was joint winner of the Metropolitan Opera Auditions, sharing first place with Martina Arroyo. She won some other prizes, and made her professional debut in a recital in London in 1959. Her first operatic appearance was at the Paris Opéra, as Amneris in Verdi's AIDA. It was one of the most spectacular operatic debuts in history; Bumbry became an instant star and was invited to join the roster of the Basle Opera. She made operatic history in 1961 when she was engaged by Wieland Wagner to sing at the Bayreuth Festival and became the first black singer to perform in that shrine of Wagnerian opera. Furthermore, musical historian Nicolas Slomimsky has pointed out that she was the first African American to make a professional operatic as a goddess, for her debut at Bayreuth was as Venus in TANNHAUSER, 23 July, 1961. He made his professional debut in 1955 at the Empire State Festival in Ellenville, N.Y., singing Dulcamara in Lï¿½ELISIR Dï¿½AMORE. His career took off after he won first place in the Metropolitan Opera Auditions of the Air in 1957. 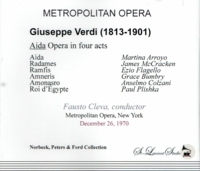 He made his Met debut in November 1957 as the jailer in TOSCA. 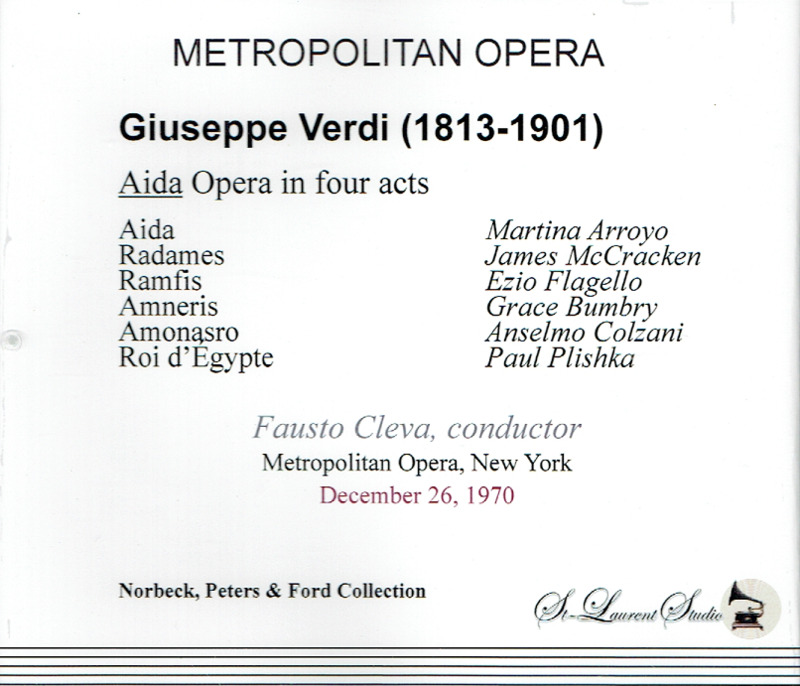 Shortly after, he sang Leporello in DON GIOVANNI, filling in for Fernando Corena, who was ill. His other performances at the Met included Geronte in MANON LESCAUT, Dulcamara in Lï¿½ELISIR D'AMORE, Sparafucile in RIGOLETTO, Ramfis in AIDA, Sarastro in DIE ZAUBERFLOTE and the title roles in GIANNI SCHICCHI and FALSTAFF. He originated the role of Enobarbus in Barber's ANTONY AND CLEOPATRA, which received its premiere on opening night of the new Metropolitan Opera House in September 1966. Mr. Flagello's final appearance at the Met was as Dr. Bartolo (a role he sang many times there) in IL BARBIERE DI SIVIGLIA in December 1984. In a NEW YORK TIMES review of Mr. Flagello's performance as Falstaff at the Met in December 1964, Harold C. Schonberg wrote, 'a singer with a sturdy voice and a good deal of intelligence, Mr. Flagello found himself thoroughly at ease with the demands of the role. That included the dramatic demands', Mr. Schonberg said. 'He did not merely walk through the role using stock Falstaffian gestures. Rather, he used gesture, expression and motion to build toward a real characterization'.